**S. A. Chakraborty continues the sweeping adventure begun in The City of Brass—"the best adult fantasy I’ve read since **The Name of the Wind" (#1 New York Times bestselling author Sabaa Tahir)—conjuring a world where djinn summon flames with the snap of a finger and waters run deep with old magic; where blood can be dangerous as any spell, and a clever con artist from Cairo will alter the fate of a kingdom. 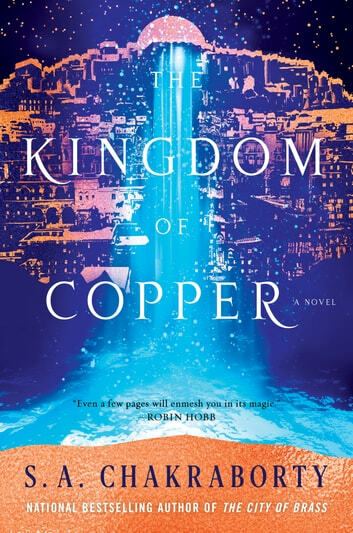 The Kingdom of Copper is a worthy successor to The City of Brass, in which we were introduced, along with Nahri, to the city of Daevabad, a magical city that has six djinn tribes living in a fragile relationship with one another, and in a hostile relationship with their mixed-race kin, called the shafits. Being an old city that has seen a lot of fights, bloodshed and grudges, it is a powder keg for a war, and this book has another one brewing. Where the earlier book had left us at Dara dead, Ali exiled and Nahri about to be married off to Muntadhir, the prologue of this one gives us the run-down of 'what happened next' and then jumps ahead five years to the year of the Navasatem, a centennial celebration of the djinn's and daevas's new way of life under Suleiman's rule. In this book, we have three POV instead of two - Dara's is added because he is now the Afshin to Manizheh, who has been plotting an invasion of the city to take back what had been decreed to her family. Meanwhile, Nahri is trying to survive as essentially a captive to Ghassan, married to Muntadhir, whom she has grown used to in the five years since, but doesn't love. Ali, saved by some Gehziri village folk, has been using his newfound abilities with water to give them irrigation. And in Daevabad, every day the shafit are being further disenfranchised, as their existence is constantly on the verge of being wiped out under a ruler that doesn't care for their well-being. While the looming war is a major arc of the book, in the case of Ali and Nahri, their development is about them reconciling tribe loyalty and tradition with their personal beliefs. Ali, betrayed by his father and left to be killed by assassins, is forced to return to the city by the machinations of the Ayaanle side of his family, again, and his arrival is something Munthadhir is not pleased with. As he tries to reach his brother, Nahri is also trying to appeal to the better side of Munthadhir, as she expects him to stay by her side as she tries to change old traditions and work for a better life for the shafit. Both their powers are also growing, while they have to keep it hidden for their own safety. Speaking of growing powers and conflicted loyalties, Dara is once again bound by his duty as an Afshin and battling his conscience as he is forced to become a weapon for war again. I would like to say he grows, too, but it is more that he is growing into an anti-hero. The characterization of this book is also better this time around, as we see the complicated dynamics of relationships between the characters and their respective loyalties driving the political machinations. Queen Hatset was a delightful addition, and I loved seeing her interact with Ali. Also, Ali being terrified of every dominating woman was fun to watch, as was him being flustered every time the issue of him choosing a bride came. Additionally, more than the readers, it feels like nearly every character is shipping him and Nahri - a slow burn that is still at a low flame level, but is certainly developing very nicely, as their friendship is being redeveloped. Dara is also a complicated subject for Nahri, as she has to face the fact that she was attracted a version of the man who was a war criminal. And then there was Ghassan, who I had said was like lawful evil in the last book, but I have decided is more of a power-hungry tyrant who has no problem playing his sons against one another. This book is long, but is so well-paced that it was hard to put it down. I didn't want to leave it at so many points, because it was so interesting, and immersive. The magic of the first book was in the descriptions of clothes and food, and while that was lesser this time around, it made up with some brilliant politics. There were some scenes that were so brilliantly written, like the tense breakfast of the royal family, or the time Nahri meets a shafit doctor - they were expressive and realistic. There are also some unintended humorous lines, from the point of view of the characters that were amusing, like Nahri treating a patient who could shapeshift into rocks, or one scene where I felt like saying "They are lesbians, Ali". The ending was a bit confusing, much like the ending of the first book, because I still can't understand how the seal and Daevabad work. There were many questions answered regarding the history of the city, as well as the original deal/curse, but there were so many more raised, and I really hope those answers are given in the final book of the trilogy. Overall, it was an 'Experience' to read this magical book, and I wholeheartedly recommend it if you love complicated political problems, well-written characterizations and an expansive world-building. A fantastic sequel! It's going to be an agonizing wait for book three, though. 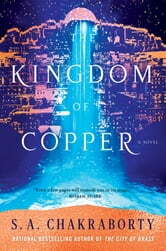 Richly imagined and well crafted, this book kept me awake nights turning page after page!